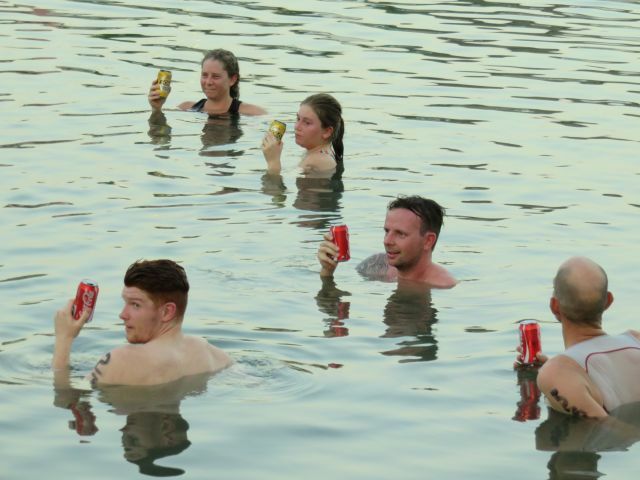 Our Christmas Splash N Dash is always fun and this year we were back to Nightcliff Pool where the big revamp of the area continues. We had to do some quick thinking to manage the course when promised gate access wasn't available, but that was all easily sorted and added to the event. Thanks to the enthusiasm of the adults and juniors alike, the joint relay was definitely the highlight with plenty of high fives happening afterwards! A huge shout out to RD Rob Weatherald, Junior Coordinator Mel Lind, water safety provider Tania Sloane, Denise, Tim, Diane, Clare & Moira and to the many other volunteers who contributed to the success of this joint senior/junior event. Thank you! With Christmas rapidly approaching many of our members depart Darwin & scatter in all directions over the coming weeks. President Tony Cox and the Darwin Triathlon Club committee would like to take this opportunity to thank our all members who have participated in our events this year; the wonderful volunteers who willingly give of their time so members can race; the coaches who have continued to assist members to achieve their goals and major sponsors who have contributed to our events (inc Ray White Bayside, Cycle Zone Darwin and Blue Cycles) - together we have had another fantastic year of triathlon and we look forward to bringing you more of the same in 2016. We hope you all have a safe and happy festive season. 1. Christmas Splash n Dash, 1km run, 200m swim, 1km run, 200m swim, 1km run (or thereabouts). 1. It is race week countdown for our latest Ironman entrants. We have Bernie Wilson, Alex Murdock, Jemma McWiggan, Gary Wall, Jon Clark and Peter Novak lining up at Ironman WA this weekend. Good luck!! 2. Later this month Dan Holmes, Nick Hubbard & Tim Green are on the list for Ironman 70.3 Ballarat. Have a good day out!. 3. 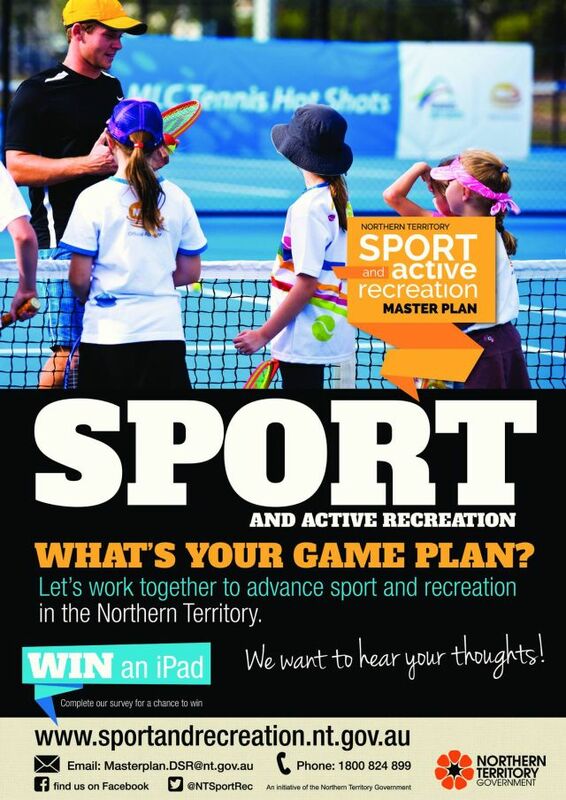 CEO Triathlon Australia Miles Stewart was in town this week & met with Triathlon NT & club reps.
4. WTC announced the demise of Ironman Japan this week. To soften the blow, Japanese competitors will have 30 extra Kona slots allocated at Ironman Cairns. 5. 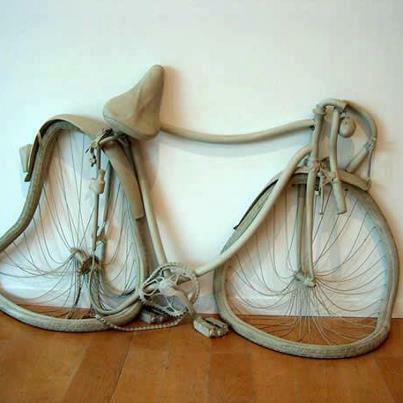 Wanting something special from your local bike shop for Christmas? Avoid disappointment by getting in there now before the racks and/or shelves are empty, they are busy, busy. Probably still time to order in some of those go faster items, just! 6. Shaye Hatty made the NT News this week. 7. 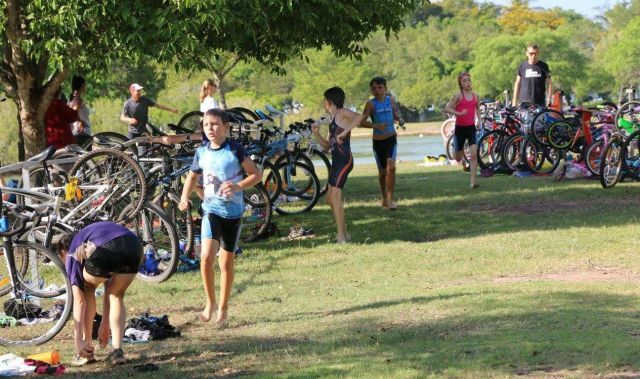 Triathlon NT Adult Beginner session is Sunday. 8. Lots of members spotted at the annual Santa Fun Run at the weekend. This is the last E News for 2015, I hope you have enjoyed it as much as I have bringing it to you. Thanks to those members who have contributed items during the year, love getting your contributions & heads up on who is racing where & when. E News will return in the New Year. Announcements, updates and news will continue through our Facebook page, Twitter and our website so do check in regularly. 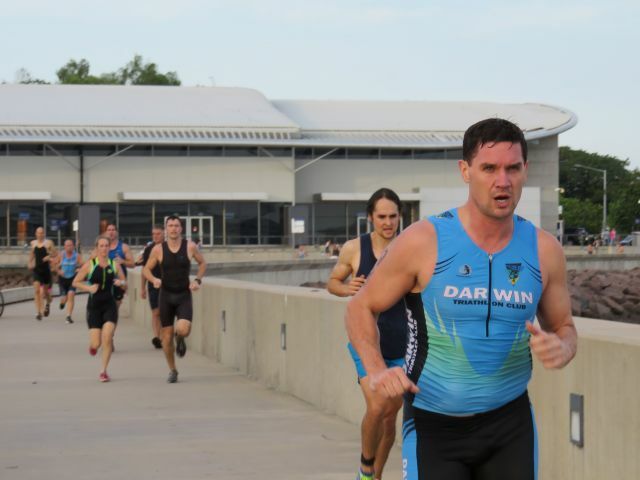 We had a great turnout of participants and lots of spectators on Saturday for our Waterfront event, the first of our annual Aquathlon Series. It was pleasing to see the competitor numbers up on 2014. A big thank you to our RD Roger Decurtins and our other superstar volunteers whose combined efforts made this event possible for our members. Our juniors were also in action and enthusiastically participated over various distances. Thanks to Mel Lind and all who helped out with our younger members. It was a top evening and a top venue! 1. Good to have a visit from former committee member Paul Sheffield who called in at the Waterfront. 2. Hearing Korgan Hucent is collecting autographs - Crowie no less! 3. 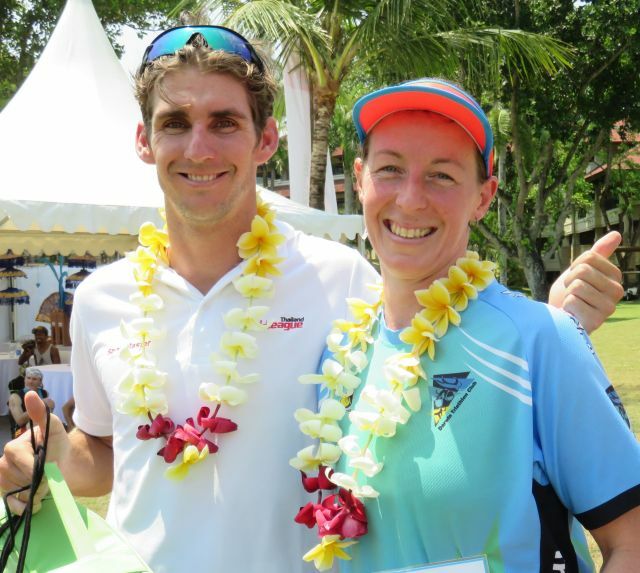 On the start list for Ironman Malaysia this weekend, Emily Heames & Sarah Collins. Good luck! 4. We have many multi talented members. Meet Graeme Parsons, author. 5. Congrats to Jim Eadie's dog Chilli - winner Nightcliff Dog Race - a number of tri dogs lined up! 6. Hearing extra 45 Ironman 70.3 World Championship slots (Sunshine Coast 2016) are allocated via the IM Tri Club program for the upcoming Western Sydney, Ballarat and Geelong events . 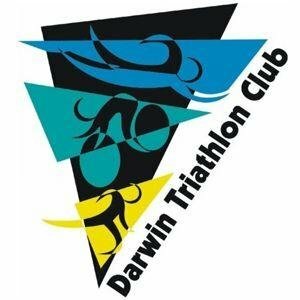 Do take the time to add Darwin Triathlon Club when you enter. 7. Our members heading for Ironman WA in a few weeks are now putting the finishing touches to their training in heatwave conditions. 8. Heading for an event between now and the end of January? Do give us a heads up if you or someone you know is racing away. 9. James Geddes (president Triathlon NT) represented NT at the Triathlon Australia AGM in Canberra at the weekend. FYI TA board of directors. distances are still to be held, check details here. 12. We have had some questions about membership (eg people wanting to join DTC as a second club, some wanting to uncheck the auto renew function). You can see Membership FAQ's here. We also ask that you go into your record and update contact details if these have changed since 1 July. 13. Strong rumour new IM 70.3 Thailand for next year.